Our names are Amanda and Kevin Stevens and we have been married for twenty-five years, we have 2 daughters Bernadette 22 years and Georgina 20 years. Georgina is a registered assistant and still lives at home. We also have two very friendly Labradoodles who love to go on walks to the park and on the hills with us and the children. We are registered for a maximum of six children under eight years each. Amanda has been registered for 18 years and Kevin for 9. Separately we both gained an OUTSTANDING grading in our last OFSTED inspections and are both NVQ CCLD level 3 qualified. We live in a four bed roomed house with a good sized garden. Both inside and outside are equipped with lots of different toys for different ages. We also do activities with the children, which are planned with the children's likes and developmental needs in mind, such as colouring, junk modelling, painting, games, singing etc. We take our responsibilities very seriously and have always been very keen to take any steps which we feel will increase our effectiveness as Registered Childminders and improve the service we provide. We have, and will continue to, undertake a series of training courses. 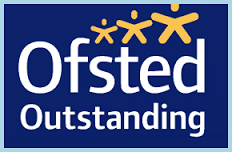 We have a regular inspection by OFSTED and both have had police, social security and health checks. Your child would be cared for in a home-like environment within a family atmosphere. They would receive a lot of individual attention whilst enjoying interaction with other pre-school children. We attend regular sessions at Childminder drop-ins, story time at the library and go on visits to the park, shops and play centres.